When it comes to knocking out high-quality headphones and microphones, Beyerdynamic have decades of experience behind them, so we were keen to try out their mid priced MMX 101 iE in-ear headphones. So what do you get for your £80? The box comes with usual set of three different-sized buds to accommodate lug ‘oles of all shapes and sizes, a little cable clip, plus a Y-adapter for connecting to laptops and PCs for VoIP services such as Skype. There’s also a little mesh carrying case provided (does anyone ever use these?). Styled with minimal fuss and frills and with smaller earbuds than most, the MX 101 iEs look understated and certainly won’t be making a fashion statement in your shell-like. 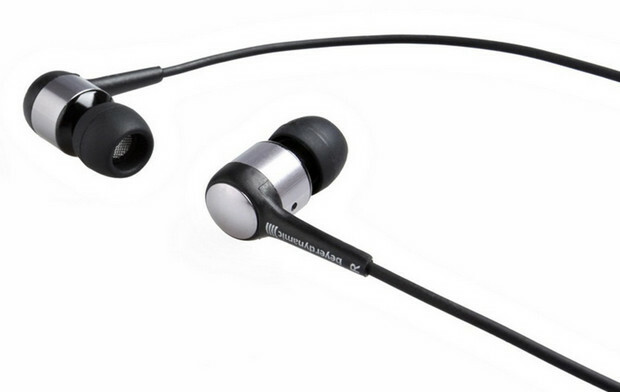 The earphones have spherical metal backings in charcoal grey, with a matching metallic band wrapping around the midsection of the earpiece, with a 13mm dynamic driver lurking inside. The lead is an ample 1.2 metres in length, with the one button controller located on the shorter left lead, and terminates with a low-profile elbow shaped 3.5mm jack. The propensity for the earphones to tangle isn’t as bad as some, but you can still expect some quality unravelling time if you’ve left the earphones in your pocket. As usual, we tested the MMX 101s by listening to a wide variety of tunes, played mainly through our Samsung S4 phone and Creative X-Fi sound card. The first thing that hit us was the amount of detail and well-separated stereo image – we were hearing musical nuances often missed by many similarly priced earphones. Individual instruments could easily be picked out, and there was a pleasing cleanness to vocal performances. At first, we were rather disappointed by the lack of real bottom end, but this was cured by changing over the earplugs to ones that provided a tighter fit. This balanced out the sound, and we were impressed with the well-defined and robust bass delivery. Delivering a clear, accurate and natural sound with a decent wallop of low-end punch, the MMX 101 iEs made for a comfortable listening experience with excellent separation. The lack of volume controls on the mic/remote unit might be an annoying omission for some, but it means that the one-button system will work with all phones. We had no problems controlling playback on our Android S4.